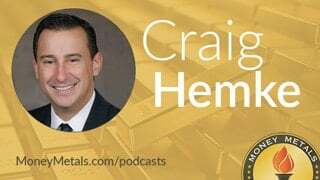 Coming up Craig Hemke of the TF Metals Report joins me for a fascinating conversation you will not want to miss. Craig tells me why we all need to pay attention to the white-hot palladium market right now and discusses the massive physical supply shortages there that have a chance to actually break the trading exchanges. He also suggests 2019 is poised to be the best year for gold and silver in nearly a decade. So make sure you stick around for my interview with Craig Hemke, coming up after this week’s market update. Well, it’s been a wild few days in the markets for stocks, commodities, and precious metals…. In spite of the trading week being shortened by a national day of mourning for former President George H.W. Bush, the S&P 500 experienced one of its widest weekly trading ranges of the year. Prices swung 5% from high to low, with most of that being recorded on the downside. The stock market did manage to avert a major technical breakdown Thursday, closing well above its low point. Stock market gyrations helped drive some safe-haven inflows into precious metals. For the week, gold shows a 1.9% gain to bring spot prices to $1,246 per ounce. If the gold market can close above $1,250, it will establish a five-month high and could be well on its way to embarking on a major rally. Turning to silver, the white metal is putting in a 2.8% weekly gain and currently trades at $14.62 an ounce. The other white metals, platinum and palladium, got hammered on Thursday. The selling brings platinum to a weekly loss of 1.0% and a spot price of $796. Palladium, meanwhile, traded at a record high earlier in the week but has given back a bit of it to trade at $1,224, now good for a 3.2% weekly gain as of this Friday morning recording. The palladium price actually exceeded the gold price on Wednesday as concerns over palladium shortages prompted aggressive buying by users. The primary source of palladium demand is the automotive industry, which requires either platinum or palladium in catalytic converters. Lately, automakers have favored palladium – a trend reflected in the $400 premium palladium now commands over its sister metal. Manufacturers now have an incentive to switch to platinum where possible. It will take time for the economic incentives to translate to actual substitution on assembly lines, however. For now, many automakers have no choice but to buy palladium regardless of price. Today’s guest Craig Hemke has a lot more to say about some of the very interesting developments in the palladium markets and some big ramifications for the other metals, namely gold and silver. So, stay tuned for that. Precious metals investors, unlike the auto makers, aren’t so constrained. They can buy the metal that offers the best long-term value. There’s a good case to be made for platinum – and possibly an even better case to be made for silver at these levels. Platinum, like palladium, is heavily tied to automotive demand. The auto industry faces risks from a potential economic downturn, stricter regulations, and trade wars involving tariffs. President Donald Trump’s tariffs on steel and aluminum have hurt some car companies even as he announced this week that China agreed to cut its tariffs on U.S. car imports. Trump has also moved to replace NAFTA with an alternative trade agreement with Mexico and Canada. It’s one of the many ways the current president has sought to move the U.S. away from the entangling alliances previous presidents championed in the name of global integration. The United States and many European countries are rediscovering national sovereignty and rejecting costly global pacts such as the United Nations Compact for Migration. George H.W. Bush: And now we can see a new world coming into view. A world in which there is the very real prospect of a new world order. A new world order can emerge. A world in which nations recognize the shared responsibility for freedom and justice. A new world order. A world where the rule of law, not the law of the jungle, governs the conduct of nations. When we are successful, and we will be, we had a real chance at this new world order. An order in which a credible United Nations can use its peace keeping role to fulfill the promise and vision of the UN’s founders. What is at stake is more than one small country. It is a big idea. A new world order, where diverse nations are drawn together in common cause to achieve the universal aspirations of mankind. The New York and Washington, D.C. media openly detest President Trump’s nationalism and used the occasion of President Bush’s passing to feign admiration for the 41st president’s “kinder, gentler” nature. Of course, during his time Bush was the target of vicious media attacks, including accusations of “racism” for favoring tough on crime policies and fake news about him being unaware of how grocery store checkouts work. The media portrayal of Bush the elder being out of touch – combined with his big government regulations and tax raising schemes — helped cost him re-election in 1992. Bush himself blamed Ross Perot and Alan Greenspan for his defeat. Third party candidate Perot attracted support from fiscal conservatives over his plans to pay down the national debt. Fed Chairman Greenspan refused to abide Bush’s preference for lower interest rates. But Bush’s decision to go back on his pledge of “no new taxes” may have sealed his fate anyway. Republicans have since learned that being the party of lower taxes is essential to their electoral success. They haven’t learned how to be the party of lower deficits, however. Neither have Democrats. Back in 1992, it was still plausible for an outsider like Ross Perot to come in and get control of the national debt. We finally have a political outsider in the White House, but the debt has grown several fold since 1992 to nearly $22 trillion. There is no political will or way to pay it down or even slow its growth. With trillion dollar deficits looming ahead of the 2020 election, Trump can only hope that voters won’t care because the economy remains superficially strong. But current Fed chair Jay Powell may trigger a recession – or worse – by continuing to hike rates. All eyes will be on the Fed’s next policy meeting, December 18th and 19th.